Eight of Swords suggests that your “ego” represents the non – trusting, doubting, over-analytical part of your mind which is unable to make any decisions – always feeling very restricted, experiencing hurt or anxiety. Recognize now that your vision has been blocked because of the fear you feel “inside” – it is creating confusion. Trying to battle more than one issue at a time will always create indecision and cause you to waste precious energy on minor details. You are unable to think clearly now – you need help and sensible advice. Pull back now, go deep inside – seek peace and allow your “inner” voice to direct you. Stop believing you will be swamped by your emotions if you take a step toward your goals – recognize that you have done this to yourself and begin to focus on developing your potentials. Stop fearing success and power – accept the beast within you. See your abilities clearly and loose your passions – you have restrained yourself from activity long enough, avoiding the present by trying to convince yourself that there are no alternatives. These beliefs keep you hemmed in – they always provide reasons why nothing will work. You are not being held back by direct force, but by your training – this belief in your own helplessness and your blind acceptance of what you have been taught. The recognition of your ignorance is the first step to true knowledge – without enlightenment you will never be able to say “this is the truth, this is the way things really are”. Recognize now that nothing prevents you from leaving – you are bound only by your own “illusions”. Balance your mind – use your creativity/imagination and your logic/reason in equal proportions. Integrate these opposite poles of consciousness. Structure your creative visions into meaningful order of thought and action. See both sides and seek out the common points – bring the opposition together and you will find your genius. The objective, conscious mind reaches the limits of the lower “ego”, which under the impact and pull of the higher emotions and compassion – realizes that to achieve even its most personal and self – oriented goals it must advance to a more mature “Ego” which encompasses more of the Universal Mind. The mind has opened to include extensions of the personal self with a mate and children and a widening circle of close friends. Now the circle must open even further. A variety of new challenges are presented with increased demands from your mental Karmic Contract. Your first reaction is to close your eyes to the magnitude of the tasks. Greater responsibility. The mind’s role in organizing is challenged by the higher order of consciousness realized as the higher emotions – compassion and universal love bring new sensations, new data that defies rationalization. To rationalize this new process is precisely what the mind must do. With this greater ability to see the extent of order in the above, so grows the ability to see the extent of disorder in the below. The effect of the combination of the lower mental levels. Creative fruitation and self-assured expression in which the lower ego is pulsing with its potential and must pair with the maturing process of uncertainty and freedom that undergirds free will. What actions, plans or ideas are being blocked by circumstances beyond your control? What would you like to do if you could get rid of the obstacles and blocks? Who or what could assist you to break free? What benefits do you receive by not acting? What is interfering with your creative expressions? Or your ability to communicate? Next to Sun: There will be a change for the better, regardless of these adverse conditions. Swords on all sides: Check into your health, there is a possibility of a need for medical attention or an operation. 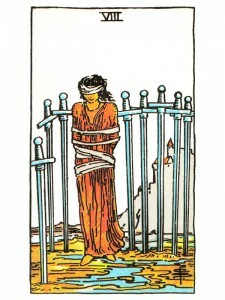 Next to Hanged Man: Do not make matters worse – do nothing now, just keep quiet. In the first position: Here is the mental crusade that is launched by the mature mind, the higher mind, which in order to be unbounded in its pursuit of universal knowledge, must bind and control to its proper limits the more limited capacity of the lower mind/ego. The paradox – in order to be unlimited the mind must be limited. In the second position: Ideas which are both solid, having proved themselves in the practical arena and ideas which are fluid and changing in search of other ideas to mix with – such is your greatest material asset. While this may be your mind itself, it is likely that these ideas have materialized into your surroundings. Physical as they may be, they are your ideas. In the third position: You may be deprived of complete understanding of the immediate situation, but only so that you may look for the greater meaning that lies beneath the obvious. Wear your blinders with conviction, letting others who offer lead you. You are far from lost – you seek a direction that ordinary sight cannot provide. In the fourth position: The passion here is for the product of mind, for some, almost a love of mind itself, a desire by mind to know mind, wherein it could then duplicate itself, multiply its contents and through such increase make its excess of knowledge available to others. To be so good at learning that there is both something to teach and the time to teach it. In the fifth position:: You do not have a clue as to how to reconcile all of the input in the present situation. But somewhere in-between what you think, what your friends and advisors think and your hunches about what the hierarchy has to say about the matter – therein lies the answer. Productive confusion. In the sixth position: Your involvement with many others in mental matters creates new dimensions in your emotional house for your relationships and your creative projects. Your intellectual progress in the near future is startling to those around you, perhaps even to yourself as well. In the seventh position: As the identity of the lower self sees its place in the universal mind and feels its thoughts merging with the one, the ego looks for ways in which it can survive and die at the same time. This is not an identity crisis if all goes well, rather it is an identity opportunity. In the eighth position: Mental enterprise is underway – the possibilities are limitless and there is great chance of success as you have utilized many levels of input in addition to your own. Many people look to you with confidence. In the ninth position: The heart sympathizes with the mind’s dilemma and is doing all that it can to meet the challenge of satisfying all facets of ego pulling the diverse views together. In the tenth position: This dark night/light morning of the soul, the death of the ego and birth of the Ego, will reach its peak not later than this time next year, but can be as soon as tomorrow or even today. Happy you found that which is perfect for you.